An iron rich, delicious snack. The pulse we can have in all ages that is extensively used for the preparation of curries, salads and toppings. And yes, we can make some interesting kids favorite snacks using this pulse. Why not, it may get a hit among all ages . 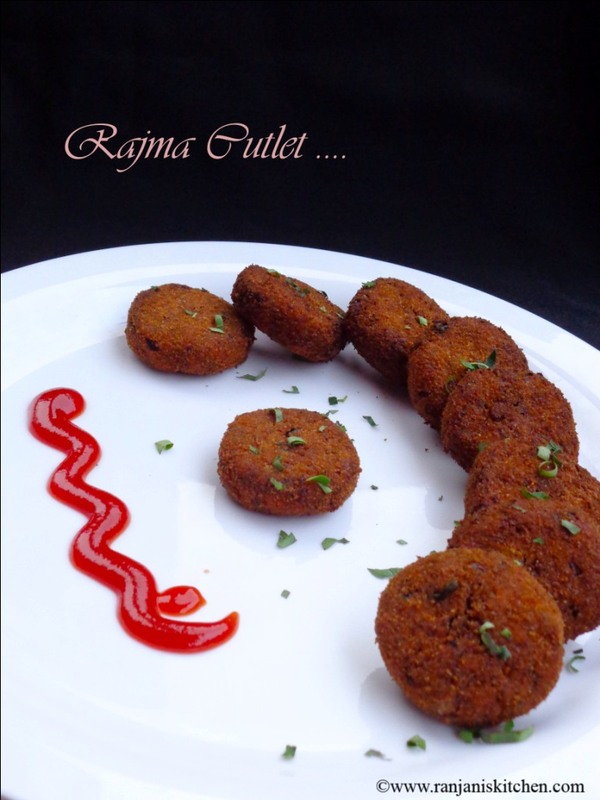 Is there anybody to hate cutlets? I didn’t meet so many. So if children don’t want to eat pulses, we can make them eat with these kinds of crispy patties. Not only in Rajma, we can try with any pulses. Also, we can apply some modifications to depend on the ingredient availability in our kitchen. Refer the notes for pan fry method. I made this very simple version. Its no ginger and no garlic recipe. But we can add a tbsp of ginger garlic paste as well. Prep time : 10 mins | Cook time : 10 mins | Soak time : 6 hours | Yields : 12 nos. Soak one cup of karamani in water for overnight. Next day, drain water and rinse for two times in tap water. After rinsing, just completely drain the water and add 1 cup of water ,1 tbsp of salt to it. Pressure cook this pulse for 4 whistles. Once done, let the pressure releases and take the karamani to check whether its cooked well. If it is not , cook it for two more whistles. Then drain the water and cool down completely. Grind the cooled Rajma to coarse mixture and keep aside. Take two potatoes if it is big or four small ones. Cut into two or four pieces and pressure cook it with salt. Peel off the skin after it cools down , mash well and keep aside.Chop onions nicely and set ready. Take the ingredients chopped onions, mashed potato, chili powder, coriander powder, garam masala, cumin powder, coarsely grounded karamani and a generous pinch of salt in a wide bowl. Mix all these without adding water. Actually, there is no need of water and it form as a perfect dough to make patties. If it is too thick or dry, sprinkle some water and make dough. 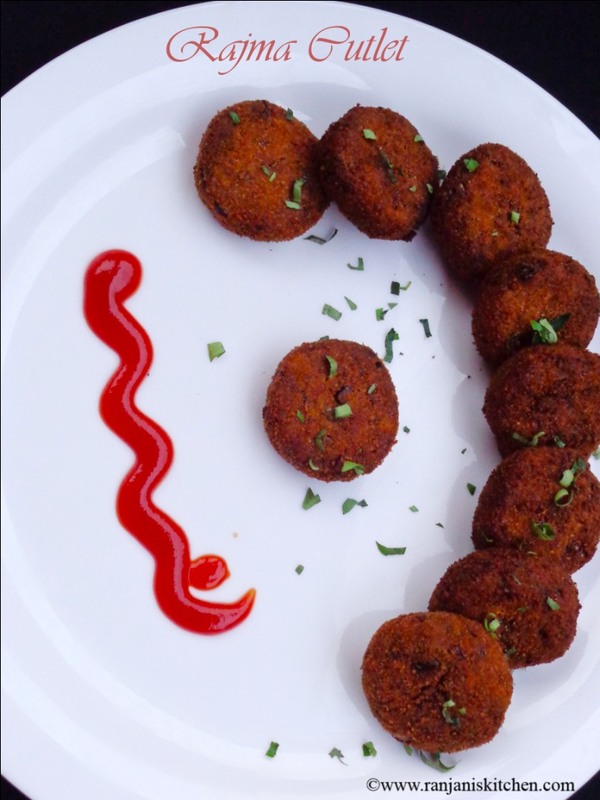 Form the dough, pinch a small portion, roll as a ball and press with palms to form as patties (cutlet). Just shape in edges for a good looked cutlets. Do the same for the remaining dough and arrange it on a plate. Now in a plate or bowl, add the Maida and water, mix well with a spoon and form as a runny mix. 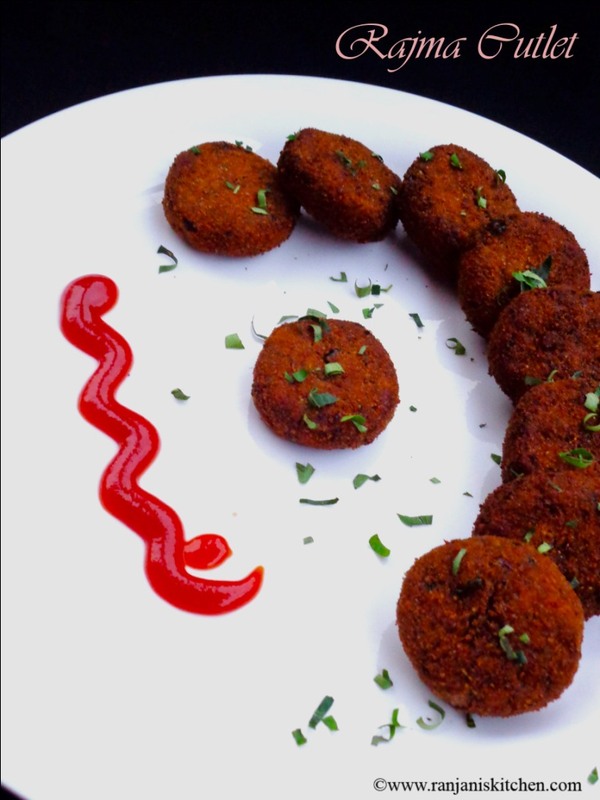 In another plate, place the bread crumbs for dressing the cutlet. Place the patties on Maida paste and cover on both sides. Place them immediately on bread crumbs and dust on both sides and edges. Give a gentle press on the patties to settle crumbs as it will not spoil the oil much. Do the same procedure for remaining patties and keep aside for 5 minutes. Heat a wok , add oil to deep fry the patties. Once the oil gets heated, let the flame medium and fry them one by one or two three sections. Evenly fry on both sides, drain the oil and place it in kitchen tissue to absorb the excess oil. Make sure the level while adding the salt as we add salt in karamani and potato while pressure cooking. We can add a small amount of veggies like cabbage and carrot also that will taste good. Add nicely chopped curry leaves and coriander leaves also for the flavor if you need. Instead of deep frying in oil, we can pan fry the rajma patties to retain the health benefits.For that just heat a dosa pan or tawa, sprinkle some oil once it gets heated. Place the patties in it. Do not place the patties very close as it will break while turning to the other side. Keep the flame medium, flip on the other side to roast well. Sprinkle oil while roasting other side as well. If you don’t want to add bread crumbs, simply pan fry on both sides. But it will not give crispy outcome, but taste wise it will be nice. The Only Vegetarian Keto Diet Food List You Need: Stay In Ketosis WITHOUT Meat! 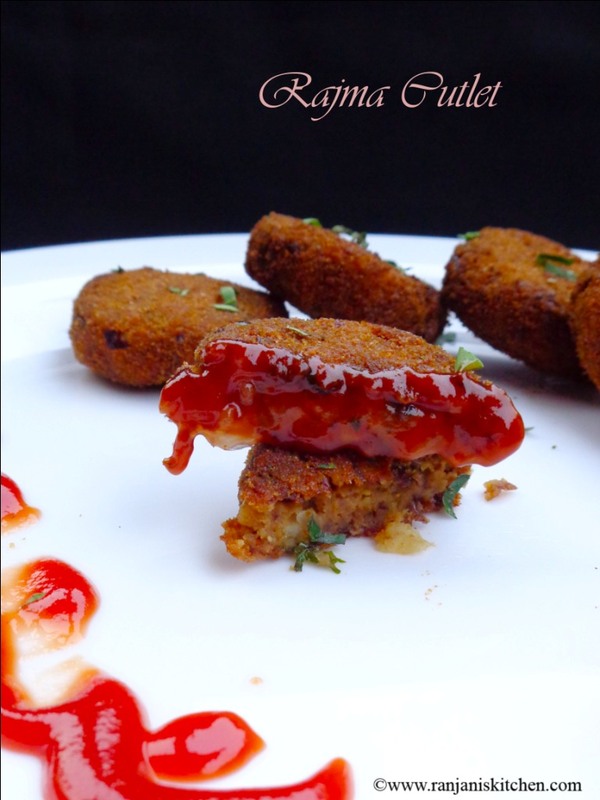 Awesome cutlets and healthy too with Rajma..Have tried another version with egg and wheatgerm some time back. Will try yours too. Lovely click!! This looks like the perfect snack! I’m getting hungry already! 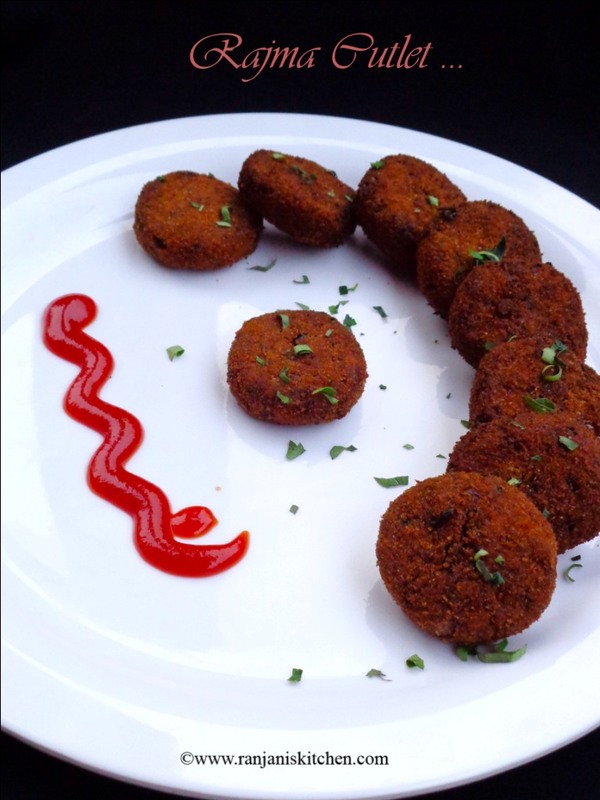 Love those crispy healthy breaded cutlets. Perfect for this winter season.